This morning, Governor Gary R. Herbert joined U.S. Secretary of the Interior Sally Jewell at the signing of a memorandum of understanding between members of the Western States Tourism Policy Council and U.S. Federal Agencies recognizing the economic importance of tourism on federal lands and waters. 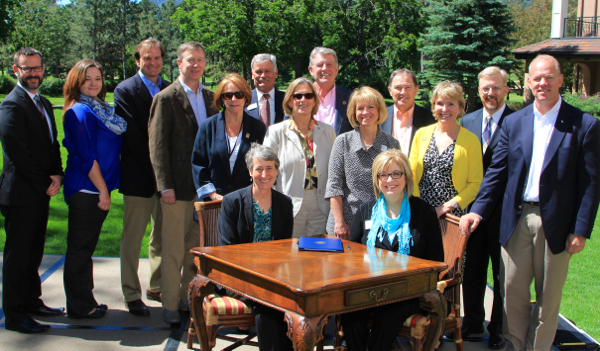 Today’s memorandum establishes a framework of cooperation between federal agencies and the Western States Tourism Policy Council to achieve the common goal of advancing travel and tourism opportunities on federal lands to produce long-term economic, business development, educational and recreational benefits, especially in rural areas. “Utah’s Mighty 5 national parks and federally managed lands are a bucket list destination for tourists worldwide,” said Vicki Varela, managing director, Utah Office of Tourism, Film and Global Branding, a signatory of today’s memorandum. In 2013, Utah’s national parks, monuments, recreation areas and historic site welcomed 11,120,963 visits. The most popular of these lands is Zion National Park, which drew 2,807,387 visits last year. Five other governors were part of the signing ceremony including: Gov. John Hickenlooper (CO); Gov. Brian Sandoval (NV); Gov. Matt Mead (WY); Gov. Jan Brewer (AZ); Gov. Steve Bullock (MT).